Someone (if it’s you, raise your virtual hand right now!) is doing a bookcase feature on his/her blog, and I originally responded that I couldn’t take part. The point of said event was to take photos of our bookshelves, since they are really interesting places, and then to post those photos and descriptions or some such. I’ve just moved, and I only brought my TBR pile and some Christmas presents with me. I didn’t feel like I had enough to show off. So there you are: picture of my current book collection. The other fourteen boxes that comprise my personal library/hoard are going to live at my parents’ house until I have the wherewithal to have them sent. What’s in your TBR pile right now? There are so many awesome books on your shelves. I want to read Beautiful Creatures and Boneshaker. You have some cool books on your shelf! I love these types of posts, lol. Awww, so cute. :) You've got some good books on there. I hope you find time to read with your new job and the craziness of moving! Hehe I love these posts too! I like squinting my eyes and figuring out the book titles ^^ Have fun reading! I have a temporary case (books that need to be read and given away) and a permanent case (books that are so good they must never leave me). hahaha, that's the third time I heard someone use the word 'crackberry' today! I love the bookshelf pictures so many people are posting. Thanks for sharing yours. I relate - I just moved, and my old bookshelves don't fit... so I have like ten boxes of books and it's breaking my heart. They need to be free! Or on shelves at least. Love it!!!!! Thanks for sharing. Look how organized you are. I have Spirits in the Park and... I can't even remember, it's so big! Great selection! I can't imagine what you must have in those 14 boxes...Thanks for sharing your little corner of the world. 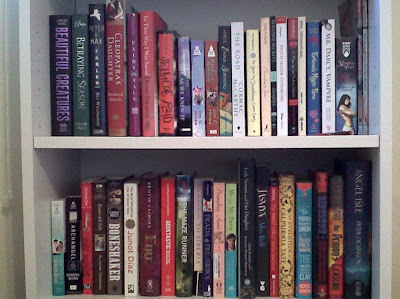 The majority of the books on my bookshelf are TBR. I'm slowly working my way through them because I told myself buying more books would only add to the problem. It's good though because as I weed through the books to sell, it makes more room on my shelves for good books.